The Apollo Twin MkII crams a lot into its modestly sized back panel, including an optical input, a Thunderbolt port, line and monitor outputs on quarter-inch jack sockets and mic/line inputs on combi-sockets. 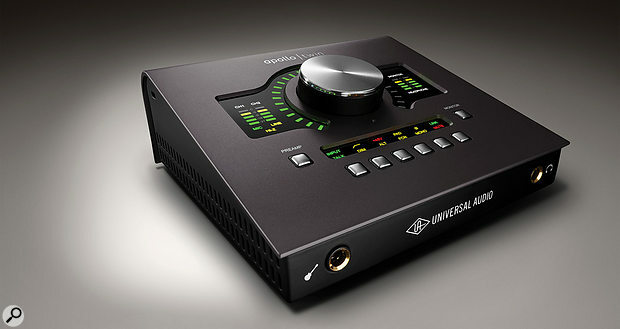 UA’s updated Apollo Twin packs in more DSP power and improved audio performance. The packaging for Universal Audio’s latest audio interface uses three words to explain its appeal: “realtime analog recording”. It’s an odd description, if you think about it. After all, doesn’t recording always take place in real time? And how can recording to a Mac or PC be analogue in any meaningful sense? Yet, if you don’t take it too literally, it’s a neat summing up of UA’s USP, which is all about recreating not only the sound of classic high-end analogue gear, but also its immediacy. This philosophy has served the company very well, and its latest manifestation is the Apollo Twin MkII. As the name suggests, this is a product that builds on the original Apollo Twin, which was reviewed back in SOS June 2014. In this review, I’ll focus mainly on the new features in the MkII version. Like the original, the MkII is an audio interface and DSP platform that connects to a host computer over Thunderbolt, and it features the same tried and tested combination of I/O. There are two analogue inputs with mic preamps that implement UA’s Unison modelling technology; a front-panel high-impedance input for DI’ing guitars and the like feeds into input 1, if used. A single optical input socket can be switched to accept stereo S/PDIF or up to eight channels of digital audio using the ADAT format. On the output side, there are two pairs of line-level sockets and a separate headphone output. Bus powering still isn’t an option, so there’s also a locking socket for the external ‘wall wart’ power supply. Oh, and you still don’t get a Thunderbolt cable, which is still mean. So what’s new? Well, for one thing, UA say they have enhanced the already impressive audio performance of the Apollo Twin. This is reflected in modest but real improvements to its specifications: dynamic range on line outputs 3/4, for instance, is now 3dB better. And for those who want more DSP power than was on offer in the original, the MkII is available in Quad as well as Solo and Duo versions. And, naturally, the MkII also benefits from all the changes UA have made to their system-wide products in the meantime, most notably the ever-improving Console utility and a wider range of Unison preamp emulations. All of these changes are worthwhile, but on their own, perhaps wouldn’t merit the development of a new product. What does is a broadening of the Apollo Twin’s scope as a hands-on controller. Like the original Apollo Twin, the MkII presents a large and friendly rotary volume/gain control front and centre, augmented by eight buttons. And as in the original, the six buttons that are arranged in a central row can be used to set the input mode, high-pass filter, phantom power, pad, polarity and stereo linking for the two analogue inputs; these settings are applied within Unison preamp models, where appropriate. What’s new is that each of these buttons now has a second function, as indicated by the additional row of symbols above them and the small dimple that conceals the new built-in talkback mic. Hit the Preamp button, and the row of six function buttons behaves as described above. Hit the Monitor button, and they control instead talkback, dim, alternate speaker switching, ‘function’, mono fold-down and mute. There are plenty of nice touches in how these features are implemented. For example, the symbols above each button are lit brightly when the relevant option is engaged, dimly when it’s available but inactive, and not at all when the option isn’t available. So, for example, if you want to use alternate speaker switching, you need to specify within UA’s Console utility how many extra pairs of outputs you wish to devote to this; once you’ve specified at least one pair of alternate outputs, the Alt symbol lights up dimly, indicating that it’s now a live option. And on the talkback front, briefly pressing the Talk button and then letting it go again latches talkback on until the button is pressed again, but holding it down for more than half a second operates it in momentary mode instead, so that talkback is disengaged once you let go. The talkback mic is available as a recording input in your DAW — two, in fact, since it’s duplicated as Talkback 1 and Talkback 2 — and even has its own Console channel strip where UAD plug-ins can be inserted. Console also lets you determine the cue-mix busses to which the talkback signal should be distributed, and at what levels. Although there are a couple of small ways in which the Twin MkII’s monitor control features don’t match up to my own personal preferences — I’d prefer it if the mono fold-down affected the headphones as well as the speakers, and I’d like the option to not have talkback always dim the monitor output — the only significant function that’s missing for working in stereo is the ability to mute left and right outputs independently. This is perhaps a use to which the ‘function’ button could be put in future; at present, it only does anything when the Twin is integrated into a larger Apollo system, and all of the available options are duplicated on other buttons in any case. Otherwise, all of the important boxes are ticked, and it’s all easy to set up and use. What’s more, although this new functionality will be welcome to those who use the Apollo Twin in isolation, it really comes into its own in a multi-unit setup. It’s now possible to cascade up to four Thunderbolt-based Apollo interfaces — and six UAD devices in total — and in an expanded system like this, the Apollo Twin can be used as a monitor controller for the other Apollos. This, I think, is a very well thought-out move on UA’s part. The Twin’s rackmounting counterparts are less well endowed with knobs and buttons, and studio racks are never the ideal place to mount such oft-used controls in any case. So, by adding an Apollo Twin MkII to an existing Apollo-based rig, you gain hands-on, desktop monitor control, and the ability to work on material away from the studio while retaining UAD plug-in capability. My only concern in this scenario would be that the shortish length of the Twin’s power cable and of typical Thunderbolt cables could be restrictive in terms of positioning the Twin, but that’s hardly a deal-breaker. Some might also feel that since the Twin MkII can control the output arrangements on other Apollos, the fact that it can’t control their preamp settings is a missed opportunity, but hands-on control is perhaps less vital in this department. Considered as a stand-alone product, then, the Apollo Twin MkII is undoubtedly an advance over its predecessor, but probably not so much so that existing Twin users would automatically want to upgrade. After all, the original Twin was already a very good-sounding interface, and if your studio is solely based around a desktop interface with only two mic preamps, it’s unlikely you’ll have much need for functions such as talkback. However, the Twin MkII will be a very tempting option for those who already have a setup based around one or more rackmounting Apollos. The ability to cascade several of these units expands the horizons of the system considerably, and should make anyone who’s previously been put off by the limited I/O counts available on single-Apollo systems take another look at the system. It’s not yet a direct rival to something like Avid’s Pro Tools HDX range — nothing in UA’s line-up is really geared up for surround working, for example — but a system incorporating multiple Apollo 16s, a couple of Satellites and an Apollo Twin MkII as controller would be a pretty mouth-watering prospect for most conventional music studios. Like many manufacturers, Universal Audio clearly envision their Console utility as being the main route through which performers will be monitoring input signals in real time. Signals monitored through the Console bypass the computer’s recording and playback buffers, so can be auditioned with near-zero latency under most circumstances. However, some of the UAD plug-ins available within the Console do add significant latency, and three levels of delay compensation — Short, Medium and Long — are available, to ensure that all your inputs remain in sample-accurate sync regardless of which plug-in chain they are passing through. There are, of course, times when you need to monitor through your DAW — for instance, if you need to monitor through non-UAD plug-ins or use soft synths. For these situations, delay compensation within the Console can be turned off, whereupon the Apollo Twin, like all the other Thunderbolt interfaces I’ve tried to date, offers very good low-latency performance. With delay compensation switched off and no plug-ins inserted in the Console, Reaper reported the round-trip latency as being 4.2ms at 44.1kHz with the lowest 32-sample buffer size, and a loopback test confirmed that this figure is accurate. Note, though, that turning delay compensation off means that if you do use plug-ins on any Console channels, they can slip fractionally out of sync with other inputs, perhaps leading to phase issues. Keeping delay compensation active avoids this risk, but the combination of delay compensation and buffering means that latency times inevitably rise — the Short delay compensation setting, for example, seems to add a further 4ms on the input side to whatever delays the record and playback buffers are contributing. 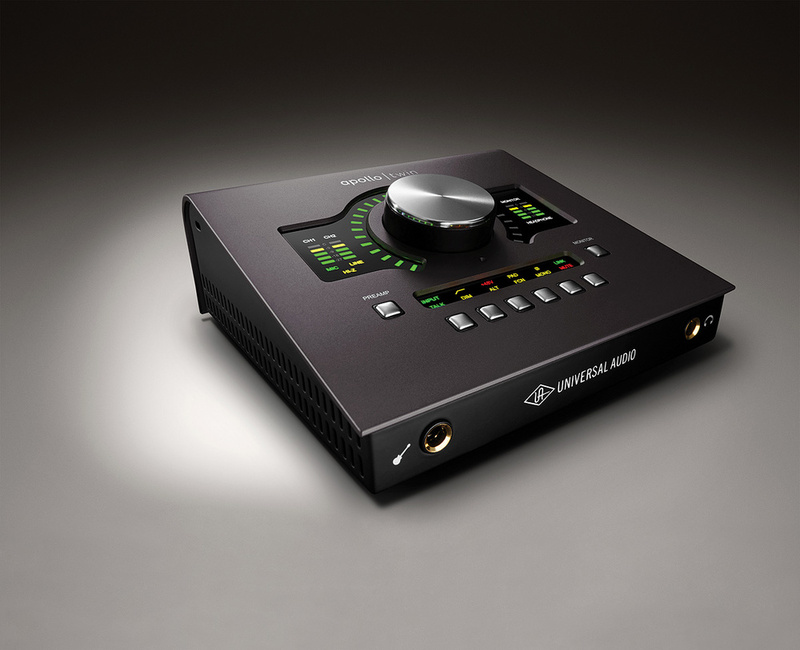 A versatile desktop interface offering excellent sound quality. Powerful monitor control features including built-in talkback and speaker switching. Can control monitoring in cascaded Apollo systems. Now available in Quad as well as Duo and Solo formats. Can’t control preamp settings on cascaded Apollo systems. As well as being an impressive desktop audio interface in its own right, the Apollo Twin MkII can become the linchpin of a larger studio setup involving multiple rackmounting Apollos. Apollo Twin Solo £590, Duo £760, Quad £1100. Prices include VAT. Apollo Twin Solo $699, Duo $899, Quad $1299.